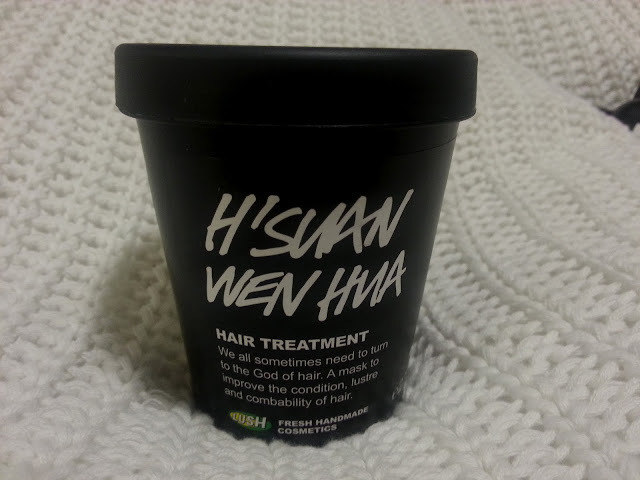 We packed into this pot everything we know of to put condition and shine back into the hair.' And I have to agree, after one wash, my hair was more manageable, shiny and smooth. Of course, this could just be on the outside, I'm not sure if it's actually made my hair stronger or anything, but externally, my hair looks and feels much better. It must have done something good, because my hair feels light,soft and nice again. The lady in Lush said that a lot of people complain about the smell of this product, my flat mate did say it made her feel sick as it is quite over powering...but I think you get used to the smell and I actually really liked it after a while. I'd describe it as smelling quite Christmassy, a bit like cinnamon. I wouldn't let the smell put me off, it really isn't that bad! -Bay and watercress infusions, balsamic vinegar and rosemary oil for shine. -Fresh free range eggs and soya lecithin for protein to restructure the hair. -Lanolin, from sheep’s wool, moisturises as it's similar to human sebum. -Olive oil to improve the tensile strength of the hair shaft. -Cinammon leaf oil for its antiseptic qualities. -Fresh organic bananas and avocados for their rich oily moisturising properties. This product was £8.00 if I remember correctly, which is probably middle range, but if you really want to treat yourself and pamper, I'd recommend this 100%, I've already used it three times and I have very long hair so it shows that you can get a few treatments out of it. I will be repurchasing this ASAP. 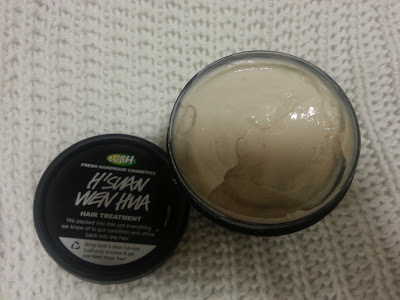 I think it may be the holy grail of hair masks, and it's taken me a long time to find a hair product that is this good and doesn't cost £30.00. It really does give instant results. Last but not least, I have been using the 'It's Raining Men' shower gel and it's absolutely delicious. It's like perfume for your hair.You can use it on your body and your hair which is good and I chose it because it smells like my favourite soap, 'Honey I washed the kids' but in a liquid format. Even after a few washes you can still smell it on your hair, it lingers like a lovely strong honey smell. If you get the chance to smell it, please do and you'll see what I mean. 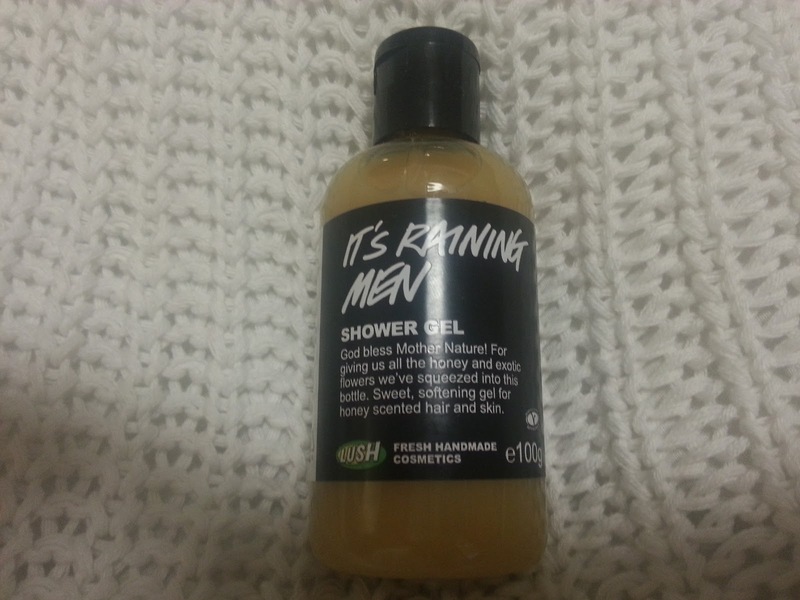 It's perfectly sweet, I'd rather use it as a shampoo than a body wash as I think it lasts on your hair longer. My only problem with this product is the price, it was £4.25 for the smallest little bottle which is very depressing for my pennies! What would you recommend for haircare? 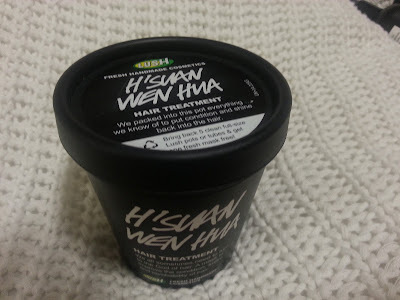 I love LUSH products, I want to try the hair treatment but cinemon makes me sick :( So unfair haha! Ive never tried a lush hair product :) may have too now! The price always makes me frown but I am loving the sound of these! Yum! I definitely think I need to make a trip to Lush next payday! The hair mask sounds brill! Great blog! I love hair products and that looks amazing.